The Black Sea Fleet’s task force group operating in eastern Mediterranean Sea off Syria comprises 15 vessels, including two frigates and a submarine, accompanied by various landing and auxiliary ships, the Russian Navy says. The task force’s strike assets are the navy’s newest frigates ‘Admiral Grigorovich’ and ‘Admiral Essen’, as well as corvette ‘Smetlivy’ and submarine ‘Krasnodar’, a spokesman for the Black Sea Fleet said on Thursday. Three large landing ships – ‘Caesar Kunikov’, ‘Nikolay Filchenkov’ and ‘Azov’ – as well as mine-sweepers, counter-insurgency craft and a tanker, are other auxiliary ships assigned to the Mediterranean task force, he added. 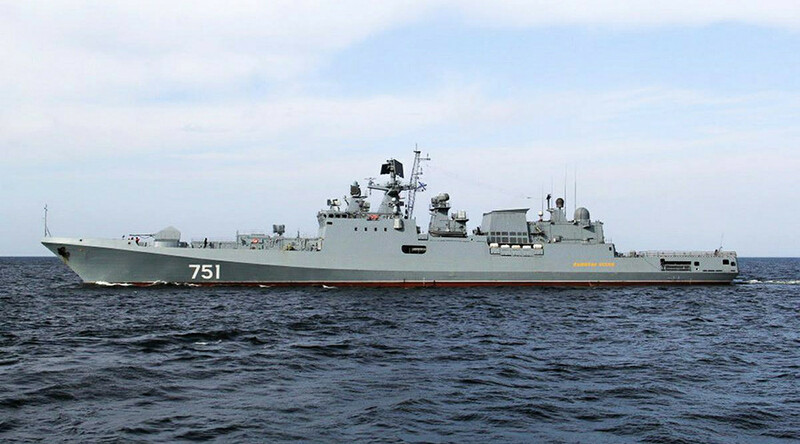 Sister ships ‘Admiral Grigorovich’ and ‘Admiral Essen’ are armed with Kalibr-NK anti-ship and coastal missiles, Shtil-1 missile system, 100mm cannon, anti-aircraft equipment and torpedo tubes. The cutting-edge frigates are also capable of carrying a Ka-27 or Ka-31 helicopter and can reach speeds of up to 30 knots (55kph). The Russian Navy’s task group operates in the eastern Mediterranean since 2012 and has seen a number of rotations, with reinforcements coming from different fleets. Last November, the group reached its peak in terms of combat capabilities when the Russian aircraft carrier ‘Admiral Kuznetsov’ arrived in the region after a weeks-long journey from its Northern Fleet’s base to the Mediterranean waters. The ‘Kuznetsov’, the Russian Navy’s sole aircraft carrier, was escorted by the heavy missile cruiser ‘Pyotr Veliky’ (Peter the Great), the largest ship of her class in the world. The naval group is taking an active part in combating Islamic State (IS, formerly ISIS/ISIL) in Syria. On Wednesday, the ‘Admiral Essen’ and submarine ‘Krasnodar’ fired four Kalibr missiles, targeting IS positions near Palmyra. Throughout 2016, the navy conducted numerous missile launches, destroying the terrorists’ manpower and materiel. In 2015, four Caspian Sea Fleet corvettes fired 26 cruise missiles on IS targets in Aleppo and Raqqa provinces. The most spectacular launch so far involved negotiations with Iran and Iraq as the missiles had to travel through those countries’ airspaces, covering 1,500km (932 miles) before hitting their targets.